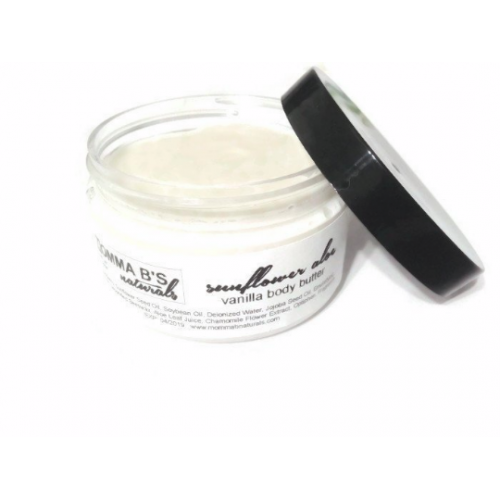 Body Butter infused with Sunflower Oil, Jojoba Oil, Aloe Vera and Chamomile Extract. Smells like vanilla bean! NO PARABENS, PHTHALATES, SULFATES, PEGS, SILICONES, ARTIFICIAL COLORS, BISMUTH OXYCHLORIDE, BORON NITRIDE, SYNTHETICS OR TALC. NEVER TESTED ON ANIMALS. VEGAN OPTIONAL. 4oz jar. Ingredients: Sunflower Seed Oil, Avocado Oil, Deonized Water, Jojoba Oil, Emulsifying Wax, Aloe Leaf Juice, Fragrance Oil (phthalate-free), Eco Natural Broad Spectrum Preservative (Benzyl Alcohol, Salicylic Acid, Glycerin, and Sorbic Acid). Sunflower Oil is loaded with Vitamins A, D and high amounts of Vitamin E. It's effective against acne, eczema, inflammation and general redness and irritation of the skin. It is also loaded with beta carotene making it effective in preventing premature aging and wrinkling of the skin. Avocado is loaded with over 25 vital nutrients including Vitamins (A, B, C, D, E, and K) and minerals such as copper, potassium, iron, magnesium, Beta Carotene and phosphorus. The oil extracted from this fruit is highly beneficial for psoriasis. It gradually removes the scales on the skin. It effectively hydrates dry skin and reduces fine lines on the skin. It also offers instant radiance to the skin. It also controls itchiness caused by dry skin to a good extent. It contains antioxidants, which help in protecting your skin from damage. It improves your skins complexion and density. It also remove dead skin cells effectively from the skin. It deeply penetrates into the skin to restore the nutrients. It helps in maintaining water in the skin, which helps in making the skin radiant and glowing. This helps accelerates the new cell generation and also helps promotes circulation in the body and skin. Jojoba Oil closely resembles the sebum of the skin, and is rich in vitamin E.